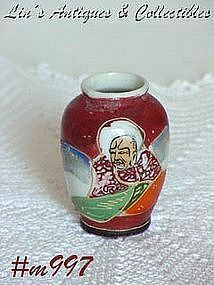 VERY NICE OCCUPIED JAPAN ITEM! THIS IS A MINI -- MEASURES 2 1/2" TALL. IT'S URN SHAPED AND STAMPED MADE IN JAPAN (A LITTLE SMUDGED BUT LEGIBLE). NO DAMAGE.